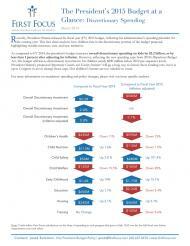 This fact sheet analyzes how children fare in the discretionary portion of President Obama’s fiscal year 2015 budget, highlighting notable increases, cuts, and new initiatives. As compared to FY 2014, the president’s budget increases overall discretionary spending on kids by $2.2 billion, or by less than 1 percent after adjusting for inflation. First Focus will release fact sheets providing more detailed analyses of the President’s budget proposal for key children’s issues, as the Administration releases policy details. See the Related Items section of this page for updates.